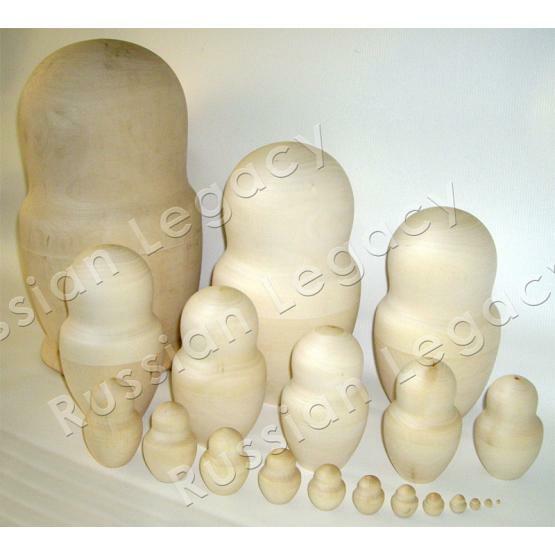 Authentic 50 piece unpainted Russian nesting doll blank made of linden wood. Represents a unique craft idea for yourself, your kids, family, friends, or school students. Paint a unique item for your loved ones. Hand carved in the village of Polkhovski Maidan, the largest wooden blanks supplier in Russia. Height: approximately 25 1/2 inches (65 cm). Weight: approximately 19 7/8 lbs (9 kg). Production time: up to 20 business days. Image shows a 20 piece set.